Do you really need an outfit dedicated to chasing flathead? IMHO no, the out fit you use should be suited to what you are using to chase them. A 2 to 4 kg outfit you normally use for tossing plastics will do just fine. A 4 to 8kg general outfit if you are fishing bait or trolling will do just fine. Flathead aren't dirty fighters and even in areas where there are obstructions they seem to fight away from these. Line in 4 kg range is a great average choice but anywhere in the 2 to 8 kg range depending on possible by catch is fine. The only I would suggest is you maintain a leader of least 4 to 5kg as the rasping teeth of flatties can make quick work of the line if they take the bait or lure down deep. Being predominantly bottom dwellers, larger than usual sinkers we would use for other species can be used to effect. A short drag along the bottom stirs up sand and mud as a feeding whiting would before a fast high flick of the rod lifting the bait from the bottom like a fleeing prawn will attract the attention of any nearby lizard. Hooks from size 1 up to 3/0 are fine and where it suits your bait long shank hooks can give added protection from bite offs. That said I have caught some big fish on no 4 hooks while jigging for pike for bait and also hooked them on 6/0 gangs in the surf so as I said use what best suits your bait. Be aware that flathead teeth are reasonably sharp and a thumb or fingers placed inside the mouth will almost certainly come out with a few puncture marks and flowing claret. Additionally they sport a twin spine either side of the head that again will have blood flowing if you handle them poorly. A thick wet towel is the best way to hold them while unhooking. 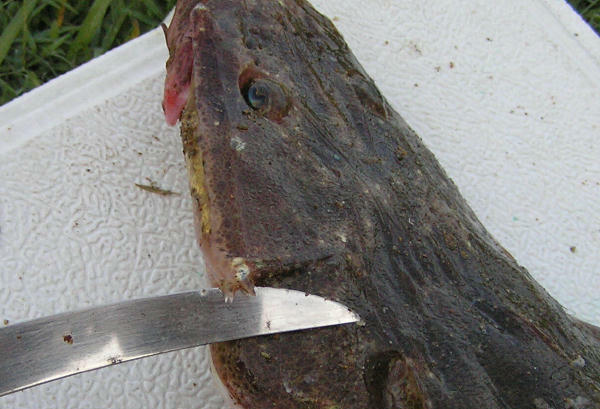 Flathead aren't really fussy and will readily take what is available in their local areas. Worms, pippies, yabbies and small baitfish in the surf are all good. Yabbies, worms, baitfish, crabs, live whiting and herring, prawns and cut baits will all produce in the estuaries. Half and full pillies will work if frozen bait is more easily accessible to you. 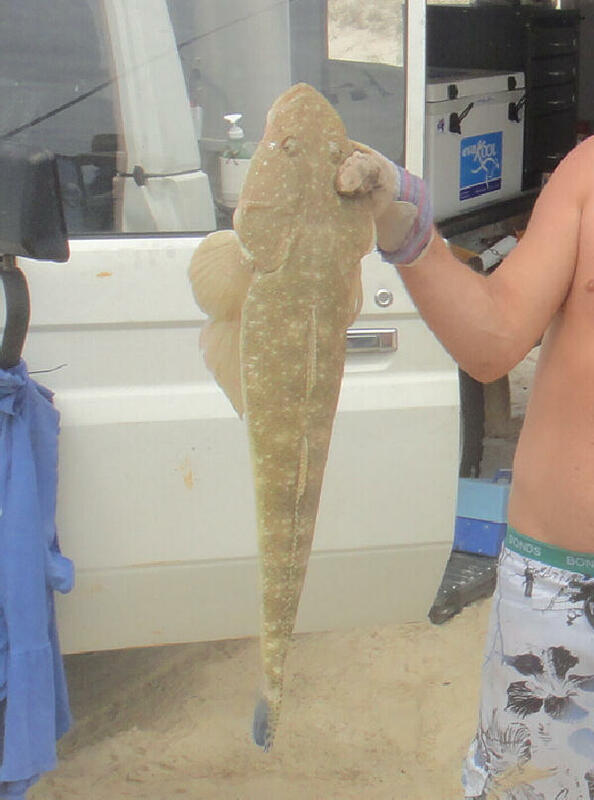 In Queensland slot limits apply for some flathead species. Most of the large fish are breeding females so netting and handling of these fish should be done with care if you are to release them. Often a single female may be accompanied by several smaller males all hoping for the chance to mate with her. With fish you are intending keeping it is most humane to either put them into an ice slurry or despatch them ike jime style (brain spiking) to quickly kill them. Flathead are a great beginners target for those learning to use lures as they are aggressive feeders, taste good, handle catch and release well and will fight nicely most of the time. 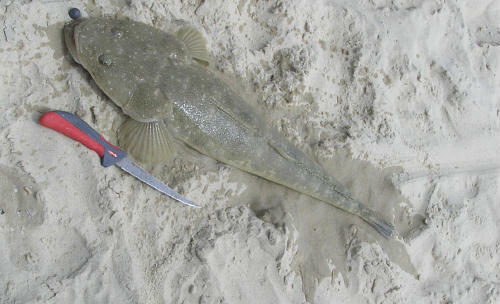 In the surf flathead present as a much lighter coloured fish due to the surroundings naturally being but lighter also. With less likelihood of much in the way of rocks or snags in these areas flathead are drawn to other features. Bank edges and mouths of drains become the areas they home in on in the search for ambush areas to catch their food. Small fish, yabbies, crabs and worms can all be displaced by wave and tide movement and where they are swept is going to be flathead central. Depending on the time of year these areas could hold none, only individuals or good numbers. Positioning yourself to fish these areas is important as you can spook flathead that are sitting in very shallow water at times. It's best if you can to pepper a few casts where you would like to be standing next just to make sure. One in front and one cast each side then increase the the number as you get closer to where you are expecting the fish to sit. Vary your retrieve rates because different days will find them wanting different feeding triggers. If fish don't come having peppered the area move onto the next decent looking piece of structure and repeat. Trying again in the same at a different stage of the tide may yield better results.